In the real world, everyone needs a resume. Whether you're a seasoned administrative professional, a warehouse worker looking for a career change, a new college graduate, or if you've been unemployed for a few months, your resume is your chance to present your specific skills, experience and accomplishments to potential employers. It's your initial impression with an employer, so what you write -- and how your write it -- are critical for success. We want to share ways to make you look your best. In this webinar, we'll cover all the resume basics, as well as the latest techniques and tips for creating and submitting resumes. We will teach you how to create a resume that will help attract a potential employer and secure an interview. 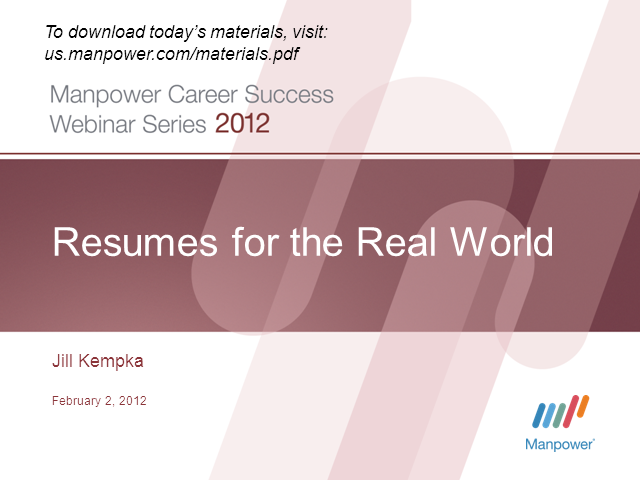 **Please note that this webinar is not eligible for HRCI credits.